We are leaving for vacation tomorrow, so I have been trying to use up what is in the house. One thing I had on hand was a butternut squash. One of our favorite recipes is corn, bean, and squash soup, but we have had that several times recently, so I decided to try something different. I thought it might make a good sauce for pasta, so I went with that. I mostly stuck to this recipe from the nourishing gourmet, but I added some cannellini beans and some whole milk at the end, since I also needed to use that up. The result was ok. Adding more salt helped a lot, but I think that it was too thick, too squashy, and too much sauce for the amount of pasta. So next time I would probably use either more millk and pasta, or less squash (and more salt). It was a nice way to use my new immersion blender though, and I have been looking for tomato-less pasta sauces recently, since I keep hearing how canned tomatoes are bad for me. 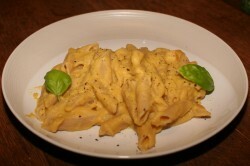 This entry was posted in cooking and tagged pasta, squash. Bookmark the permalink.